Portwenn has a new constable in the third season of ITV's delightful hit series, Doc Martin and-- aside from a wicked case of narcolepsy-- he may as well be the twin brother of David Brent's sycophantic sidekick Gareth Keenan on the BBC version of The Office. 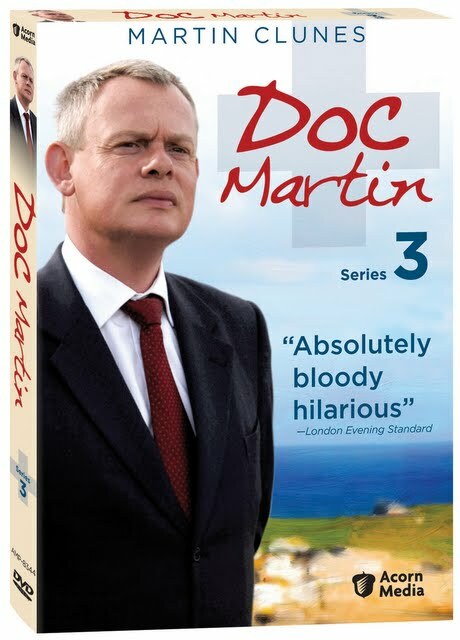 Speaking in odd cadences that make every sentence sound like a stern warning from a hall monitor for cutting gym class, the officer is just one of the new and entertaining sources of humor for the Martin Clunes series, which hits its stride in the 7 episodes contained in Acorn Media's 2-disc slim-cased set. With Louisa's ex gone with the wind and a new determination for “our doc and our headmistress” to finally have a successful dinner date, the third installment is this series' most charming to date as the medical cases for Clunes' misanthropic MD are not only stranger than ever before but the giggles grow steadier and louder as it continues. While most people would be heartbroken to discover that their crush is ill, Martin vows to make the most out of Louisa's anemia diagnosis after she faints in the season opener. Unfortunately, taking extra care of the teacher he adores is one thing but per usual, Louisa's presence makes him appear even less together than he already is, and he ruins a romantic kiss by rattling off pre-period hormonal statistics after unexpectedly bonding with her during a bad bout of food-poisoning. Since his own faint-inducing fear of blood is what sent him from posh city life to small town Portwenn (think Northern Exposure's Cicely, Alaska blended with Gilmore Girls' Stars Hollow, Connecticut), the doc decides to try and distract his receptionist Pauline's boredom and growing online gambling addiction by sending her off to earn a certificate in IV and blood work. While the diseases prove incredibly baffling as Martin must try to figure out if it is really just ADHD that is making a young schoolgirl “very annoying,” similarly the plot-lines become increasingly complicated, fast paced and involving as well. From trying to reason with his Aunt Joan when she takes a lover more than half her age, making an enemy of new age parents who don't believe in actual parenting-- other than a surprise return of a former resident and a shock in the relationship between the doc and headmistress, perhaps the most startling event occurs when the doc discovers there's another woman vying with Louisa for his affection. Playing down everything with his deadpan, humorless approach, Clunes makes you roar with laughter with a simple look or gesture. And when you combine this skill with the sheer likability of the rest of the cast-- particularly Caroline Catz as Louisa-- you realize that, while you wouldn't want to move to the medical drama isle of Portwenn, it's nonetheless a highly desirable place to visit again and again... whether or not the doctor will see you or you see the constable nod off during patrol instead.